The grapes are starting to ripen around San Diego County, it's time for Crush! Curds and Wine has everything you need for this season's harvest, from yeasts, nutrients, and enzymes as well as equipment rental. We can also hook you up with some fresh grapes, either pick-your-own locally or delivered to Curds and Wine for pick up. Contact us about specific grape availability, or see our Harvest 2011 web page for more information. We also have barrels in stock, call or email us for availability, pricing can be found online. NEW STORE HOURS -- Now open on Wednesdays! Curds and Wine will now be open Wednesday through Friday 11 am to 7 pm, Saturday and Sunday 10 am to 5 pm; we will have extended weekend hours in September and October as well for harvest season, closing at 6 pm. You can also contact us if you have a supply or equipment emergency, we can usually meet you at the shop even on off days to get you set up with whatever you need! 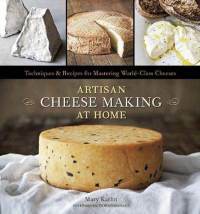 Come in to Curds and Wine to get your copy of Mary Karlin's recently released book, Artisan Cheese Making at Home. Mary often teaches cheese making classes locally at Great News cooking school in San Diego, watch for her upcoming classes -- they sell out fast! This book is a comprehensive guide to home cheesemaking, complete with gorgeous pictures of actual homemade cheeses, as well as unique cheese recipes and recipes to use your homemade cheeses. She has extensive descriptions of starter cultures, milks, other ingredients and hardware, followed with over 80 cheese recipes. A must-have for home cheese makers! The San Diego Cheesemakers Group is now having regular meetings, every 3rd Tuesday of the month at 6:30 pm. If you are interested in joining the group, sign up online for the discussion group. Meeting places will change for each meeting, catch the discussion so you know where it is every month! The first meeting at Alesmith brewery on August 18th was a huge success. Over 30 local veteran or aspiring cheesemakers came together to share our common interests. Chris Banker, organizer of the group, was elected first President of the club. Other officers will be nominated and elected in upcoming months, as we all get to know each other. Many great cheeses were shared, including several goat cheese creations, homemade brie and blue cheese, and Peter's jalapeno cheddar. Thanks to everyone that brought cheese! We are looking forward to learning a lot from each other at upcoming meetings. Le Gamay Nouveau est Arrive! Winexpert's Special Release Gamay Nouveau is out this month! Make up your Gamay Nouveau now so it will be ready for the traditional Beaujolais Nouveau release date the 3rd Thursday in November. Then you can proudly serve your own homemade Nouveau! This wine is also great for Thanksgiving. We only have a few in stock, so get yours today at Curds and Wine! Read more about this special wine online. Post pictures of your Gamay Nouveau party on our Facebook page!